Member of Hellenic Statistical Authority (2010 - 11). He was one of the four members approved by the Greek Parliament with a majority of 4/5 or more. Member of the Tax Tribunal of the Republic of Cyprus (2004 - 07). 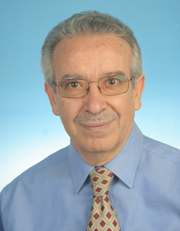 Member of the House of Representatives of the Republic of Cyprus (1991 - 2001). He proposed legislation so that students studying abroad or citizens who are abroad on Election Day should be able to vote at their nearest Embassy of Cyprus. Motions of his for the establishment of the State Scholarship Foundation of Cyprus and Equality for the Sexes, regarding foreign spouse citizenship rights, became state laws by unanimous vote. He was a Council Member of the Interparliamentary Union (1992 - 2001), the Parliament of Parliaments, and Rapporteur for Middle East Problems. He was also a member of the Cyprus-European Union Joint Parliamentary Committee (1991 - 96) and Rapporteur for Education and Culture. Minister of Education and Culture of the Republic of Cyprus (1988 - 90). He proposed legislation establishing the University of Cyprus by the Law 144/1989 (see THE UNIVERSITY OF CYPRUS LAW 1989 TO 2013). He was the Chairman of the Preparatory Committee for the Establishment of the University and the first Chairman of its Temporary Governing Board. He is a Reviewer of more than 450 papers and books for Mathematical Reviews and / or Zentralblatt fur Mathematik -233 zbmath Reviews (Andreas N. Philippou (Patras), A.N.Philippou (Nicosia)) and 258 MathematicalReviews). Among them are included papers or books of the most prolific mathematician writer Paul Erdos, the well known statisticians Peter Hall, C.R. Rao and Milton Sobel, the former Rector George Roussas, the former Vice-Rectors Vic Barnett και Stratis Kounias, and the Editors N. Balakrishnan και R.A. Johnson. He lectured and presented papers extensively at conferences and universities in Europe, India, North America and Russia. In 1984, he initiated the international conferences on Fibonacci numbers and their applications, which are held since then every two years in a different country. He was their Co-Chairman until 2004 and in 2008 as well. He is a Co-Editor of seven books (refereed proceedings of the international conferences on Fibonacci numbers and their applications) published by Reidel and Kluwer Academic Publishers (1986 - 98). A paperback edition of the book published in 1986 was republished in 2001. He is a Member of the Editorial Board of the Fibonacci Quarterly (http://www.mscs.dal.ca/Fibonacci/, Fibonacci Number-Theorists). He was Supervisor and Faculty Committee Chairman for the Ph.D. degree of four graduate students at the University of Patras (1981 - 1991). He was also Supervisor and Faculty Committee Chairman for the Ph.D. degree of a fifth one (2004 -2010). All five are now teaching as professors of various ranks at universities in Cyprus and Greece. Faculty Committee Member for the Ph.D. degree of several graduate students at the University of Patras and outside Examiner for seven Ph.D. students (two each at the universities of Delhi and Piraeus, and one each at the universities of Ioannina, New England and Thrace. The above all completed and received their degrees. Supervisor and Faculty Committee Chairman for the Master's degree of five graduate students (three at the University of Texas at El Paso, and two at the American University of Beirut). Faculty Committee Member for the Master's degree of four graduate students (one at the University of Texas at El Paso and three at the American University of Beirut).